Holidays and food…the combination can make almost anyone nostalgic. Do you honor tradition with a favorite recipe or two? I didn’t know my father’s mother very well. Grandmother Ernst was Swiss, and reserved. I was too young when she died to have forged a close relationship with her. I have no personal mementos, no treasured keepsakes. Not so with my mother’s mother. Grandma Johnston lived long enough to know that I’d developed a sincere interest in family stories. Each year Grandma J. baked hundreds of Christmas cookies. Wherever I happened to be, I could count on receiving a tin box full of Christmas cookies. I visited one December during her final years, when her health was failing. She sat in a wheelchair in the kitchen, directing my grandfather as he mixed cookie dough. I can still see her frail hands patting the dough into balls and placing them carefully on cookie sheets. 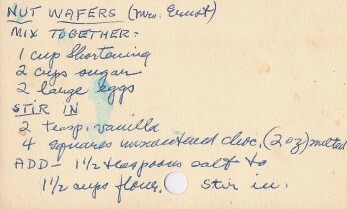 After Grandma J. died, I inherited her recipe cards. Some were decades old, battered and ink-stained. Some were much newer, even typed. If she’d gotten the recipe from a friend, she noted the name. 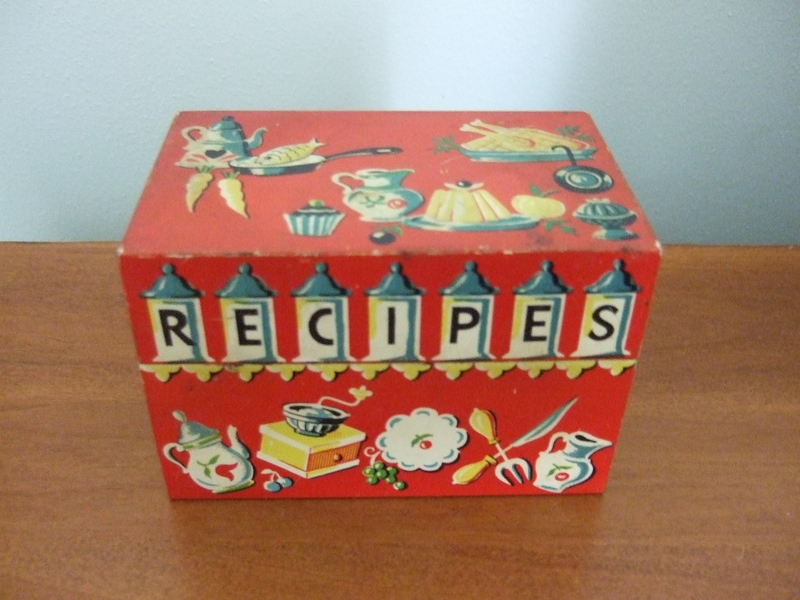 My Grandma Johnston's recipe box. I’d never know that Grandma J. had gotten this, or any, recipe from Grandmother E.. I could hardly wait to bake these cookies. Following her recipe precisely, I mixed up a batch. I used Grandma J.’s old brown bowl, the one she’d always used for cookies. I knew the Nut Wafers would be perfectly wonderful. After all, both my grandmothers had liked them. Well, they weren’t perfect. The dough was to0 sticky to form as directed. 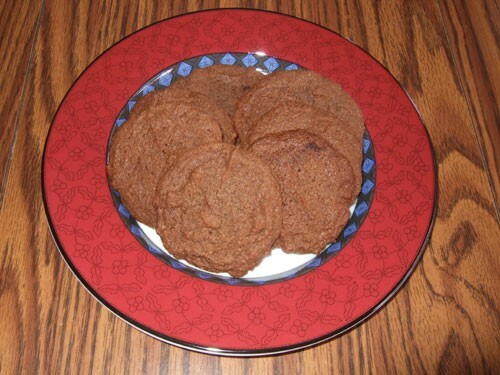 When I baked the cookies, the edges crisped before the centers had set. I spent a couple of days feeling sad. Then I gave myself permission to tinker. With just a couple of minor changes, I ended up with a cookie that I love. Each December, I bake Nut Wafers. Doing so still makes me feel close to both of my grandmothers. It doesn’t matter that I changed the recipe a bit. Traditions evolve. Now the recipe belongs to all of us. Cream the butter with the sugar. Beat in eggs, vanilla, ground nuts, and melted chocolate. Stir the remaining ingredients together in a separate bowl, and then add slowly to the dough mixture. Drop by rounded teaspoons onto a greased cookie sheet, about 2″ apart. These spread, so don’t use too much dough. Bake 10-12 minutes at 325 degrees. Cool slightly before moving to a drying rack. This post originally appeared on Amy Alessio’s wonderful vintage foods blog in 2009. This entry was posted on December 13, 2011 at 6:15 pm and is filed under FOODWAYS. You can follow any responses to this entry through the RSS 2.0 feed. You can leave a response, or trackback from your own site. I love the idea of your grandmothers’ sharing the recipe and along you come to perfect it. SWEET, indeed! My grandmother was born in Austria and was a wonderful cook and baker. One of the pasteries she made was something she called “fludden” which was dough, wrapped around raspberry jam and chopped nuts and raisins. I have tried a number of different doughs and not one tastes like grandmas. Does anyone know the proper dough for this pastery. Another things she made was onion-poppy seed cookies. I would love to receive a receipe for this. Thanks for any help.